We are one day away from our 2nd annual community celebration We Love Old Oakland. As co-chair and social coordinator, I am always excited and touched by the community support given by our neighbors and friends! Please join Old Oakland Neighbors in a Community Celebration! 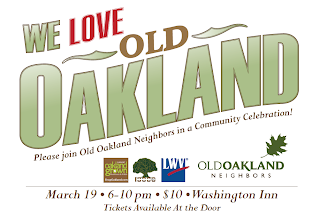 Entertainment, Delicious food, Stimulating Conversation, and more in support of Old Oakland! Hear music from Oakland based artists. The OON logo t-shirts have also arrived. Logo by a Market Square resident, screen printed in West Oakland on a organic natural cotton, undyed American made t-shirt...show your neighborhood pride at a low, special event price! OON will appreciate if you forward this invite to anyone you think would be interested! Old Oakland Neighbors sprung from the momentum of those who gathered in summer 2006 to work with Neighborhood Services Division, Oakland Police Department, Public Works Agency, and Office of Parks of Recreation to address crime and nuisance issues. We are a grassroots community group that welcomes residents, business owners and other concerned individuals in our neighborhood. We meet regularly to address many different types of issues and as well as to have FUN. Please visit our website at: http://OldOaklandNeighbors.org for more information or to join.